Explaining football and teaching the game to children appears to be a daunting task. There are rules, positions and game strategies to consider. However, if you take the time to break it down slowly and the children you are teaching are interested in learning about the game, it will be much easier for the youngsters to pick up. Start off with the basics and show them a few fundamentals to help make learning the game enjoyable. Explain that there are 11 players on each team. The team with the ball is trying to score, and that unit is called the offense. The opposing team is trying to stop the offense, and that group is called the defense. Tell your students that the offense tries to advance the ball by running or passing the ball. The quarterback passes the football, the running backs run with it and the receivers catch passes. The offensive linemen provide the blocking that gives the other players the time and opportunity to make plays. Explain that the defense tries to tackle the player with the football. In addition to tackling the offensive players, the defense tries to intercept passes and force fumbles. The defensive linemen try to keep the blockers from protecting the quarterback and opening holes for the running game. The linebackers tackle the running backs. The defensive backs try to bat down passes, intercept the ball or tackle receivers. Teach players that the offense needs to gain 10 yards per possession to retain the ball by earning a first down. If the offense does not gain 10 yards, the opponent gains possession. Explain to youngsters that professional games consist of four 15-minute quarters and so do college games. High-school games usually consist of four 12-minute quarters. If the games are tied at the end of four quarters, overtime is played. Explain that the offense wants to move the ball all the way down the field and put the ball in the end zone for a touchdown. A touchdown is worth 6 points. After the touchdown is scored, a team attempts a point after touchdown by kicking the ball through the goalposts. A team can score 2 points after the touchdown by running or passing the ball into the end zone. The extra-point attempts are attempted from the 3-yard line. Tell youngsters that a team can kick a field goal worth 3 points if it does not get the ball into the end zone for a touchdown. A field goal is successful when the ball is placed on the ground and kicked through the uprights. Tell the children that a team can score 2 points and record a safety if the opponent gets tackled with the ball in the endzone. Show the youngsters how to pass the football. You must put your fingers on the laces and then step and throw the ball to the receiver. Demonstrate how to catch the ball with your hands. A receiver needs to put his hands out in front of his body and catch the ball and then bring the ball into his body. A receiver cannot let the ball hit his chest and then try to catch the ball. Show a young person how to make a tackle. It's important that a youngster drives his shoulder into his opponent's midsection and then wrap his arms around the ball carrier and drive him to the ground. The most important thing is never to lead with your helmet when tackling. Players can suffer devastating head and neck injuries when leading with their helmet and this must be avoided at all levels of the game. While serious injuries at the youth level are uncommon according to a study performed by the Mayo Clinic Department of Orthopedic Surgery, players can learn the proper way to tackle as youngsters and have a much better chance of avoiding major injuries later on. 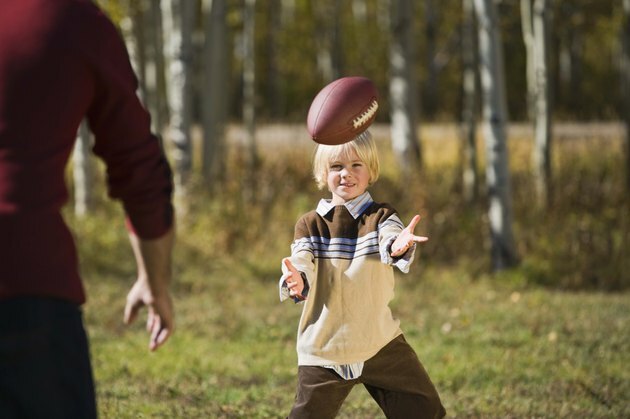 Watch a football game on television with your youngster and point out what the quarterback is doing, how the offensive line is blocking and how the defense is attempting to stop the offense. Watching a high-school or college game is exciting, but it is much easier to teach the game when watching it on television. Record the game so you can go over the big plays and key moments. What Happens If You Get a Red Card in Soccer?